We get it, ok? Virtual reality—it’s all very exciting and cool. Who wouldn’t want to be transported to another world that’s way more awesome than this one? But Samsung, who’s known overdoing it, is now turning popular roller coasters across North America into insane torture machines using Gear VR headsets. That image above are what Samsung and Six Flags are calling New Revolution and Superman VR coasters. People like you and me are expected to strap phones to our faces and pretend like we’re a pilot fighting aliens or Superman thwarting Lex Luthor instead of suffering through a miserably boring roller coaster #IRL. The coasters will be ready for season pass holders as early as March 10 and will spread to nine Six Flags locations: Arlington, Atlanta, Los Angeles, St. Louis, Lake George, Montreal, San Antonio, Agawam (Massachusetts), and Upper Marlboro (Maryland). The details on how this all works are still a little hazy, with the big questions being how to keep headsets from flying off your face and if I can sue Samsung if someone throws up on me. 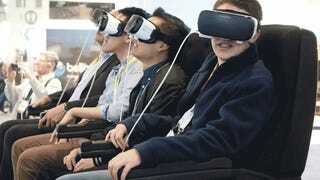 Luckily, it looks like the Gear VR stuff will be optional, so you can still go on any roller coaster like normal. Man, and we thought this future was bad.